CareFree Mosquito Free Water Tension Eliminator, 16 oz. Prevent mosquitoes from landing on and laying eggs in the standing water in your yard using this CareFree Mosquito Free Water Tension Eliminator. These insects require still water to thrive, and this innovative product keeps them from doing so. The spray removes the surface tension of water, preventing the mosquitoes from floating when they land, eradicating them from your area. This spray bottle makes it simple to cover the water in your bird bath or rain barrel with a light mist, which remains effective for up to a week. The product is safe for use around pets, birds, plants, and fish, and can be used on any areas of standing water for versatility. Stop mosquitoes from overtaking your backyard with this Mosquito Free Water Tension Eliminator. Made in the USA. 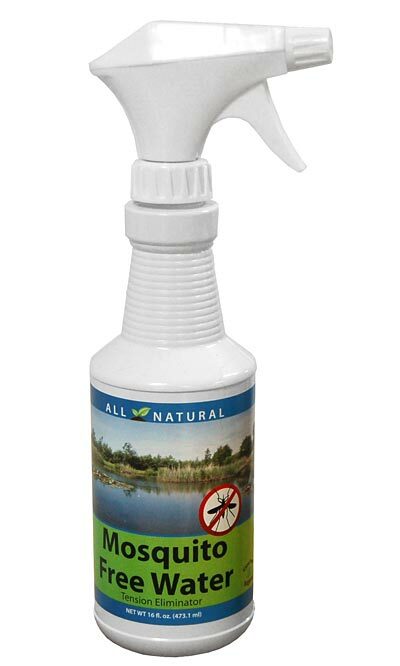 CareFree Mosquito Free Water Tension Eliminator, 8 oz. Bonide Mosquito Beater Granules, 1.3 lbs. CareFree Pond and Fountain Protector, 16 oz. CareFree Bird Bath Protector, 4 oz.